Are you in someone else's frames? Desert Lady - aka "Lady"
Lady's sire line is made up performace horses. Lady's sire is Legion of Merit winner Triple A Basktyn++. He earned his points in twenty shows. At halter, Triple A Basktyn++ has captured three championships, three Reserve Championships, eight firsts, three seconds and one third place award. In the English Pleasure division, Triple A Basktyn++ has acquired one Championship, one Reserve Championship, five firsts, two seconds, three thirds and three fourths. In addition to this fine show record, Triple A Basktyn has earned the titles of 1977 Region Five Champion English Pleasure Horse and 1977 Region seventeen Champion English Pleasure Horse. All these top placings and his Legion of Merit Award by the tender age of ten. Her grandsire Brusally Gwiaztyn is a champion in Park & Halter. Triple A Basktyn's++ dam is by the champion Park & halter stallion *Bask++. Lady's dam line is of domestic and crabbet breeding. Her dam is a granddaughter by the beautiful Fadjur. She goes to other noted horses: Ferneyna(producer of 4 champions); the great Ferneyn; Fer-Natta(producer of 4 champions); the *Raffles son - Aaraf; Aarah(producer of 4 champions); the *Raseyn son - Abu Raseyn. 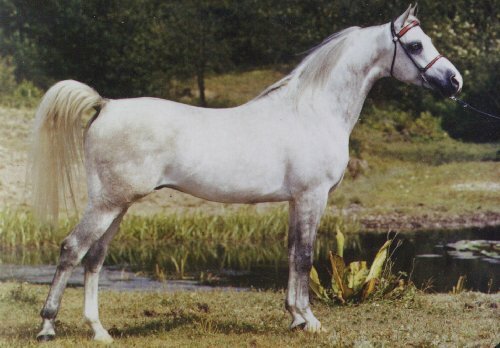 Ferneyna was a champion mare and U.S. National Top 10 winner; producer of champions; and Aristocrat of the Arabian breed. Tre-Jur, one of Ferneyna�s sons, was Canadians Breeder�s Champion. Lady is gone and we miss her dearly. She was a "tent mare". Anyone could ride her and she responded to their experience. She would put her head right to the ground when a 3 year old boy wanted to take her halter off. She just stood still when her two green riders fell off and were screaming. I could also get on her and she had the will and energy to get into her rocking horse canter. She listen to all my problems and didn't judge me...just offered peace and tranquility. Miss you Lady. Thank you for visiting Destiny Farm's site.